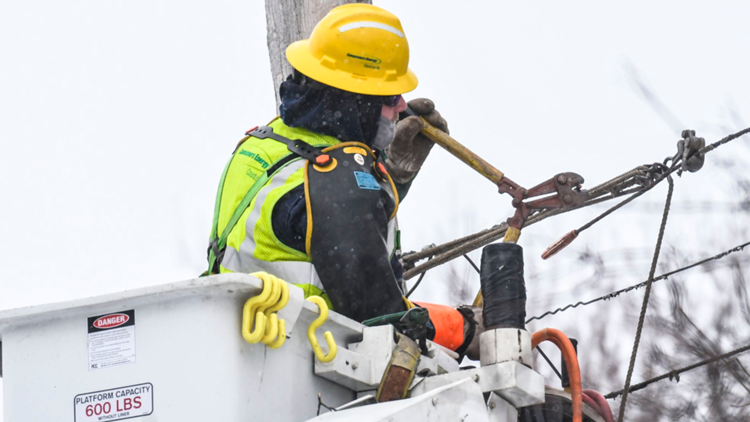 Consumers Energy worked around the clock to restore power to hundreds of thousands of West Michigan residents after severe weather in early February. The bulk of remaining outages are in Ionia County. After more than 230,000 Michigan residents lost power due to severe weather, the number of Consumers Energy customers still affected by an outage are dwindling. The utility company said that they expect to get the bulk of power restored by Sunday night, with some of the hardest hit areas to be repaired by Monday. As of 8 p.m. on Sunday, less than 500 customers remained with power in Kent County and less than 500 in Montcalm County. Ionia County has the most without power, with nearly 4,500 customers still waiting for their power to be turned back on. Back-to-back ice storms and high winds hit West Michigan hard last week, and Consumers Energy has been working around the clock to restore power to the area. "We appreciate your understanding in the wake of last week’s ice storms and high winds. We have made significant progress in repairing the damage and returning power to 98% of the customers who lost service," the company said on Sunday evening. More than 1,200 Consumers Energy employees and contractors have been working to restore power. They were joined by 200 mutual assistance crews from Indiana, Kentucky, Illinois, Iowa, Louisiana, Missouri, Oklahoma and Tennessee. As people are returning to their homes, the Kent County Health Department warned Sunday that those who have been without power for days may also be facing food insecurity. An issue especially impacting the elderly and people who have mobility and transportation issues. Any food left unrefrigerated for more than two hours should be discarded. Check out the USDA's website to see what foods should be discarded and which are considered safe after a power outage. Late on Saturday, Gov. Gretchen Whitmer declared a state of emergency for the city of Grand Rapids to unlock state resources and funding to help with the clean-up after the severe weather. The city opened an Emergency Operations Center on Thursday, and it continues to operate 24 hours a day. The city, with the state's assistance, is removing tree debris throughout Grand Rapids. Teams will be working for the next seven days to remove branches and limbs from private and public property.